Arestelle is my oldest and (more-or-less) main character, by which I mean that she is the only character who follows the epic quest line much at all. She is an elvish hunter. Not much to say about this get-up; it’s all armor received as part of the game’s Introduction, except the cloak, which was an early quest reward near Celondim if I recall correctly. 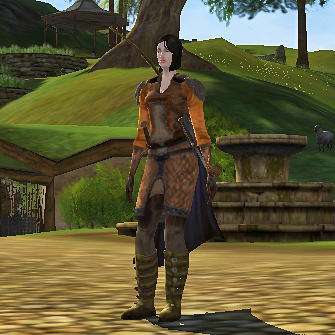 Jacket and leggings are dwarven; all armor is medium (she’s a hunter, after all). I dyed the jacket rust and the cloak navy with dye from Intro quest rewards. 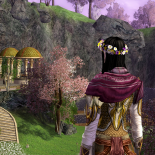 This entry was posted on 2014.03.17 by vyh in Outfits and tagged arestelle, blue, brown, cosmetics, elendilmir, lord of the rings online, lotro, orange, outfits, starter gear, starting gear.